I am always thinking about new ways to style and market my vintage nightwear & lingerie and the idea of wearing it in ways that weren’t intended has been floating around in my mind for a while – a couple of years ago photographer Kerry Curl sparked off the idea of certain night dresses as festival dresses (that’s a summer project/shoot we’re planning to do one day, British weather permitting!) and more recently I was chatting with stylist Karen James-Welton, Fabulous Miss K, around the idea of silky slips as evening wear, teamed up with faux fur or leather jackets (think 1990s Kate Moss!) and killer heels or converse trainers until, eventually the three of us got together over coffee & planned a photo shoot on the streets of Norwich in November with the images forming the core what I like to call my ‘Nightwear as Daywear – Underwear as Outerwear’ campaign! Hardly looks like the same outfit worn by Estelle in the top photo? 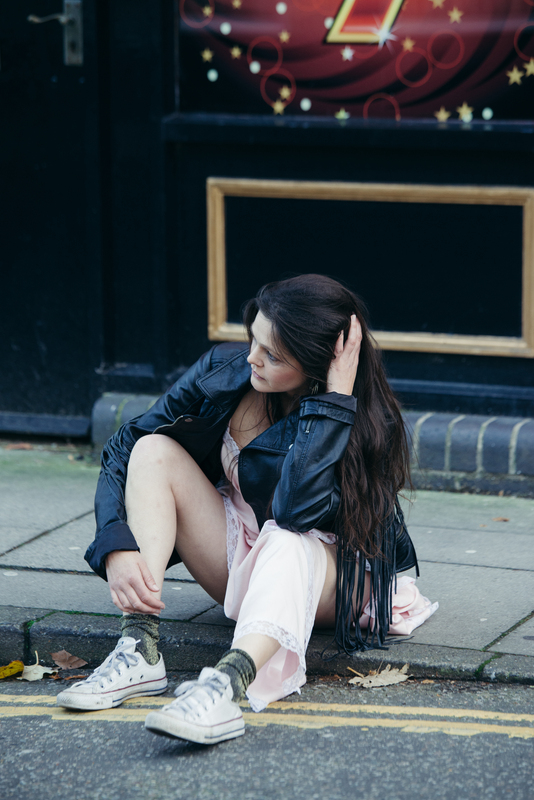 In our shoot, we went for a ‘morning after the night before’ look (think Kate Moss again!) with our party girls wearing the nightdress as evening/club wear. Here’s Estelle Long again, teaming it up with fringed leather coat together with socks & trainers. 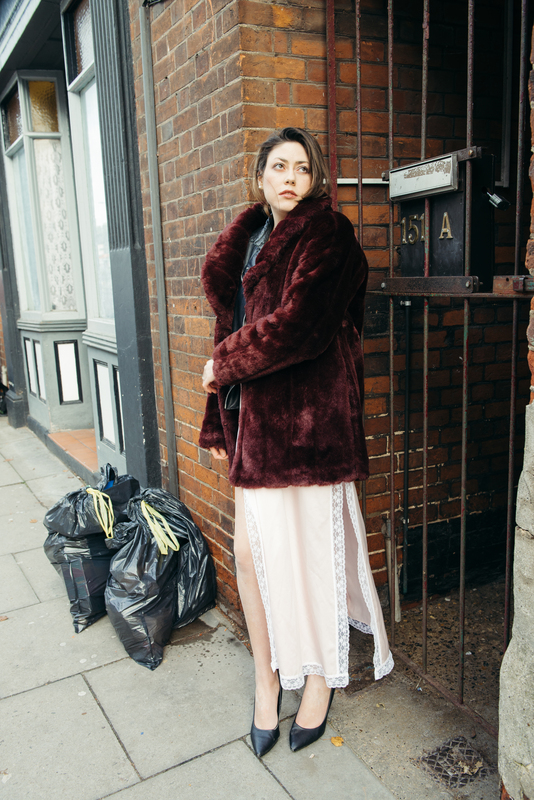 For a slightly different feel, model Nakita Harden wears the same night dress with a luxurious deep burgundy faux fur coat & high heels. Or in contrast, with a bold leather jacket & sporting her Louis Vuitton (model’s own!) Nakita looks very in control of her style in this image. If you’re Norwich based, keep a look out for my collection on the catwalk at Norwich Fashion Week Vintage Show this year, on Sunday 12th March at Open, where I will continue to explore this theme or watch this space for my photos and review afterwards. It’s an exciting time for wearing vintage fashion in any way you choose. Images featured throughout show models Estelle Long and Nakita Harden wearing vintage nightdress from Wake Up Little Susie. Hair & make-up and styling by Karen James-Welton, The Fabulous Miss k and the incredible street photography is by Kerry Curl .